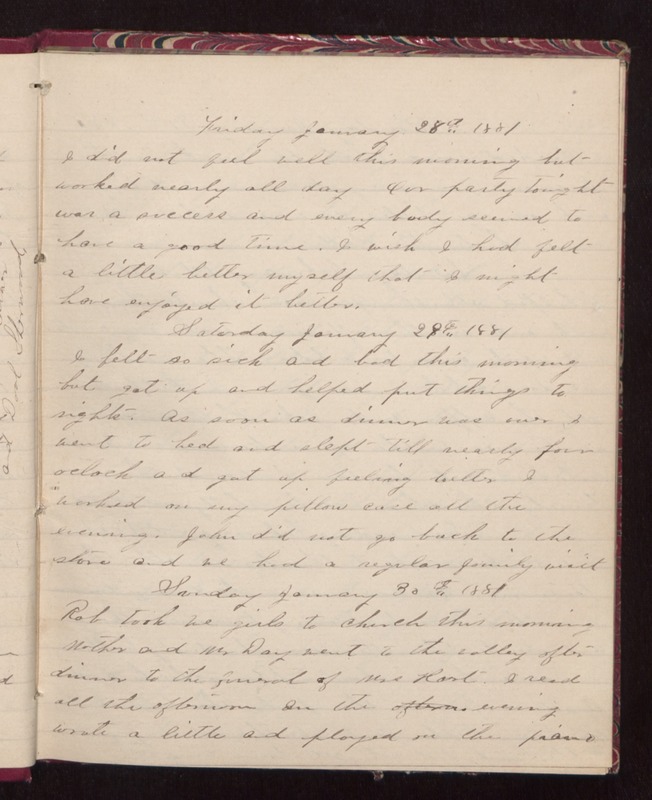 Friday January 28th 1881 I did not feel well this morning but worked nearly all day. Our party tonight was a success and every body seemed to have a good time. I wish I had felt a little better myself that I might have enjoyed it better. Saturday January 29th 1881 I felt so sick and bad this morning but got up and helped put things to rights. As soon as dinner was over I went to bed and slept till nearly four oclock and got up feeling better. I worked on my pillow case all the evening. John did not go back to the store and we had a regular family visit. Sunday January 30th 1881 Rob took we girls to church this morning. Mother and Mr Day went to the valley after dinner to the funeral of Mrs Hart. I read all the afternoon. In the evening wrote a little and played on the piano.